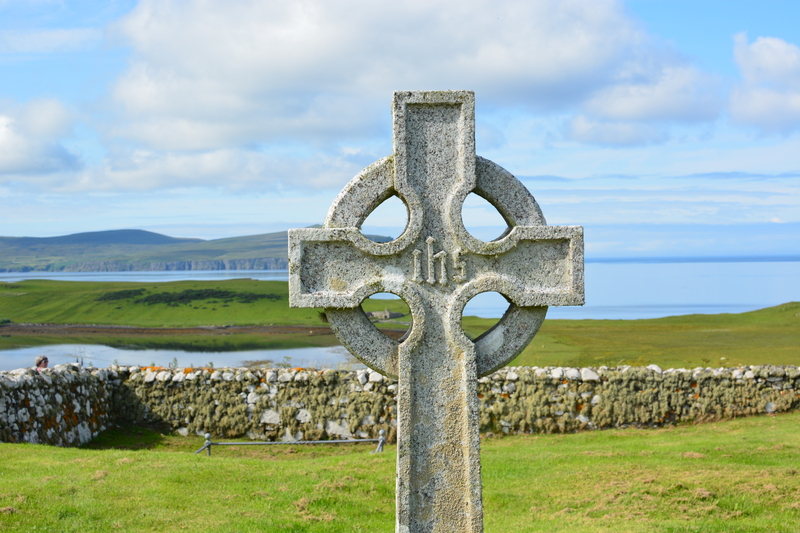 On the 1st Sunday in May of 1578, a retaliatory event in an ongoing feud led to one of the most well-known MacLeod stories, and one with ruins that can be still visited today– The massacre at Trumpan Church. The year prior, again in retaliation for an earlier event, the MacLeods had killed a large number of the MacDonald of Clanranald inhabitants of the Isle of Eigg, who had hid in a cave. 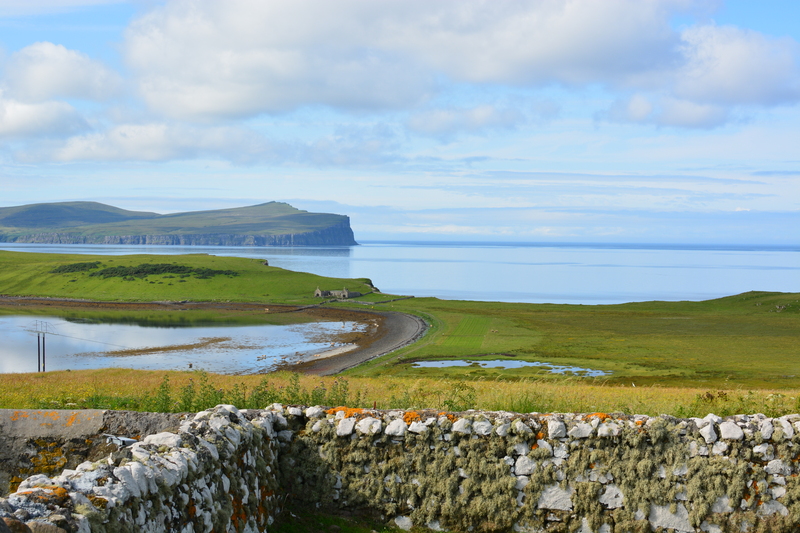 Clanranald was set on revenge, landing several war galleys on the beach, seen in the background of the previous picture, on a Sunday, when most of the MacLeods of this part of Waternish would be gathered in the church. They barricaded the door, trapping the worshipers inside, then set fire to the thatch roof. The story goes that one woman was able to escape out the very narrow window, but other accounts claim she came out through a portion of the roof that had not caught fire yet. 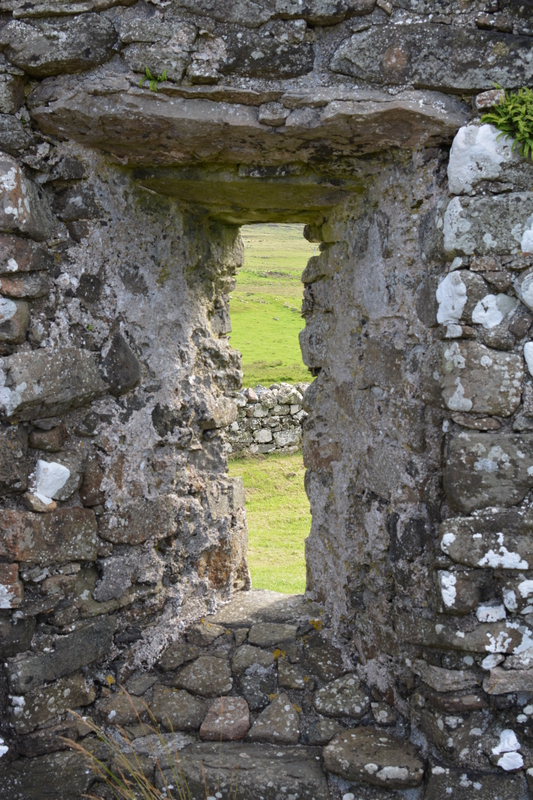 Whatever the manner of escape, she fled to Dunvegan Castle and was able to inform the Chief, who immediately gathered a party to meet the invaders. The MacDonald retreat to their home on the Isle of Uist was prevented by the tide, which left the ships high and dry on the beach. When the two armed groups met, there was a huge slaughter, and the MacDonald of Clanranald force was wiped out. The fight was called “The Battle of the Spoiling of the Dyke”, as burying all the dead would be a huge task so a dam was breached to wash the bodies out to sea instead. This entry was posted in Isle of Skye, Scotland and tagged Clanranald, History, MacLeod, Massacre, Tourism, Trumpan. Bookmark the permalink.